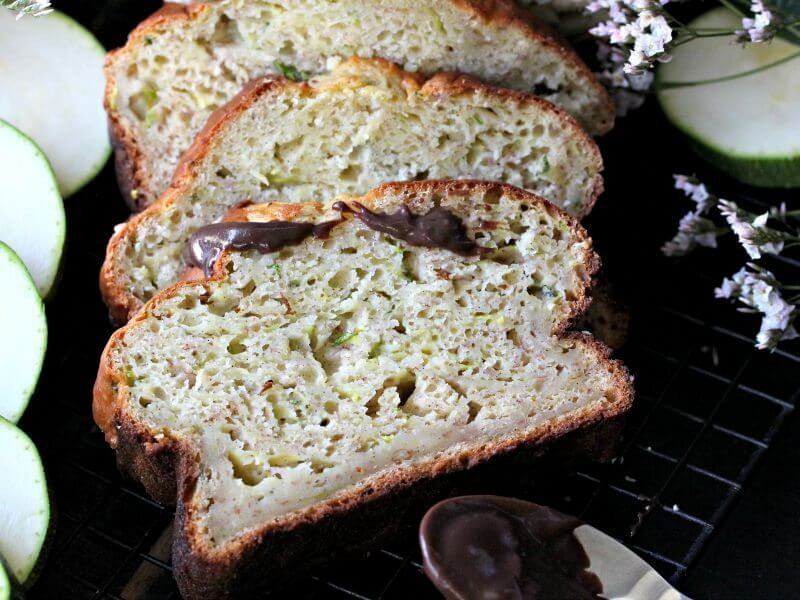 Zucchini Banana Bread is soft and aromatic made with yogurt, vanilla beans and chocolate ganache. It is the best possible way to use zucchinis this summer. Making zucchini desserts is our obsession. We have made the delicious Blueberry Zucchini Poke Cake, Chocolate Zucchini Bread and Zucchini Bread. I decided to make this Zucchini Banana Bread because its again that time of the year when you see zucchinis everywhere. I almost went with a lemon zucchini combo here, but since I had the vanilla beans on hand, I settled on a more classic version. Also, I must say that I am very happy about it, the vanilla beans are beautiful, you can see the tiny specs in the batter. In addition, the aroma is nice, but not overpowering, making for a very decadent combination with the chocolate ganache. This Zucchini Banana Bread is the perfect snack, while not the healthiest, it still packs a lot of goods for you. For example, it has fruits, veggies, yogurt, eggs, no added butter and no oil. Yet, its still soft and it melts in your mouth. Subtle vanilla flavors, a golden crust covered in chocolate ganache and beautiful specs of zucchini thru it. Always measure the zucchini. I usually use 2 medium zucchini. However, after you drain the water, measure two cups packed. In addition, choose smaller zucchini, as larger zucchini tend to be drier, tougher and have a bitter taste. Also, you can add chocolate chips if you please. Watch the bread closely after 45-50 minutes of baking, to make sure not to over bake it. I like to check on it at the 50 minute mark and if it still needs more baking, check on it every 5-7 minutes until done. A toothpick inserted in the center of the cake should come out clean. To avoid burnt edges, if the bread is still not done, but the top and edges are already golden brown, cover the bread with aluminum foil and continue baking. Make sure you check on it, to avoid over-baking. Serve the bread warm or room temperature. Additionally, you can also warm up slices in the microwave and it tastes delicious with some butter..
Loaf Pan – huge fan of their products, always great quality! How do You Grate Zucchini for Bread? Don’t peel the zucchini, it melts into the bread, so peeling is just unnecessary. First, wash the zucchini well under warm water, use a vegetable brush to remove dirt. Then, cut both ends off of the zucchini. Set a stand up box grater on a plate or cutting board on the counter. Next, shred the zucchini by continuously running it over the large holes of the grater. Can You Use a Food Processor to Grate the Zucchini? Wash the zucchini well under warm water, use a vegetable brush to remove dirt. After, cut each zucchini into several smaller pieces for easier grating. Fix the food processor with the grating attachment. Add the zucchini to the food processor in batches if needed and grate. CAN YOU FREEZE THE ZUCCHINI BREAD? This bread also freezes well. Cool the bread completely and fully wrap it in plastic wrap, tightly. After that wrap in aluminum foil. Freeze for up to 1 month. Defrost before slicing. You can also freeze individual slices. Grease a loaf pan with melted butter (2 tbsp.). In a high speed mixer fitted with the whisk attachment, beat together yogurt, sugar and mashed bananas until well mixed. Add in the eggs one at a time, vanilla bean seeds (cut the beans in half and with a knife scrape the seeds) mix until smooth consistency is achieved. In a bowl mix dry ingredients – baking soda, baking powder, salt and flour. Add to the batter one cup at a time, mix on medium speed until well combined. Press the grated zucchini between your palms to remove as much water as possible and add it to the batter, using a spatula, carefully fold it in. Adjust rack to the middle of the oven and bake for 50-60 minutes or until a wood tester inserted in the center comes out with only a few moist crumbs attached. Place the chocolate, corn syrup and butter in a medium bowl. Heat the cream in a small saucepan over medium heat until it just begins to boil. Remove from heat and pour over the chocolate. Let stand one minute, then stir until smooth. Cool to room temperature. When the cake is cooled pour the chocolate ganache on top of it. Oh this looks like the ultimate zucchini bread! I’m loving the vanilla beans in here and that rich chocolate ganache on top. I think this would make the perfect breakfast or dessert! Hey Gayle, you are right it made the perfect breakfast this morning! 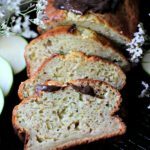 Love this zucchini banana bread – it looks divine and I really love the decadent chocolate ganache! So good. i never get tired of zucchini and chocolate combo. I have so many fresh zucchini in my garden right now so this is perfect! I love that you added the chocolate ganache too. Chocolate makes everything better, right? So jealous that you have a garden with fresh zucchinis, you must put them to good use! YEP I am one of those people who is terrified of veggies in desserts but I’ll always go for a zucchini bread because you’re right you can never taste i! Yours looks beautiful and I love that it’s both zucchini and banana! This zucchini banana bread gets my seal of approval too! You are so right about the zucchini explosion! I’m seeing them everywhere! I think your lemon version would be delicious too! This looks so moist and amazing! Love the vanilla beans in it. This banana bread looks perfect! Love all the zucchini and vanilla beans in here! The chocolate ganache is such a wonderful addition! I love baking with yogurt. 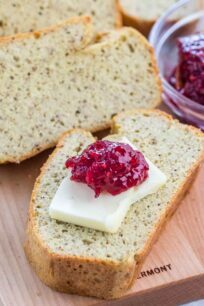 I haven’t tried it with zucchini bread yet, so I can’t wait to try your recipe! Chocolate just makes the bread even better! Hi Jessica, let me know if you get a chance to try it. Its really good! I love that you can see bits of zucchini in this. With most, you can’t! I know! I can’t believe it’s Friday?!!! This week flew by! 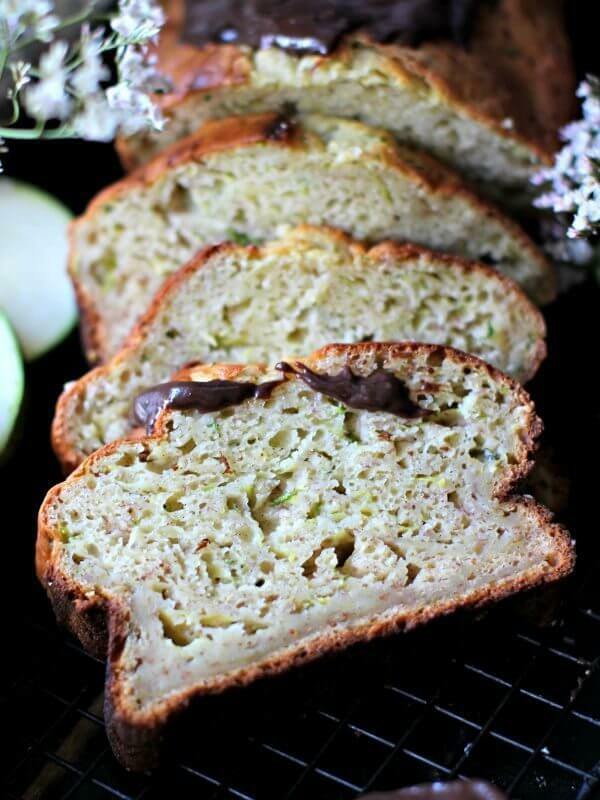 ok, I LOVE baking with zucchini and LOVE the idea of making a banana bread!!! this looks so good!! Thanks Alice, have a nice weekend! Fantastic use of complimentary ingredients in this summer standard; loving it!! My Mom use to always make zucchini bread when I was growing up. This version seems even more delicious with the banana and chocolate ganache! Thanks Linda, the chocolate ganache makes this bread so much more indulgent! This looks so delicious! I still haven’t tried baking/cooking/eating zucchini, it’s time I change this! That and veg just makes cakes sweet and moist. Two things that cakes should always be!!! Looks so delicious! And, moist, just the way it should be. Never had it with chocolate though. YUM! Love zucchini bread! Must try this one! Pinned! Oh my gosh, zucchini bread is the best! Zucchini’s are one of my favourite ingredients to bake with – I love their moisture! This looks so delicious, and I love how you added yogurt to the mix! Thanks Emily have a great week! 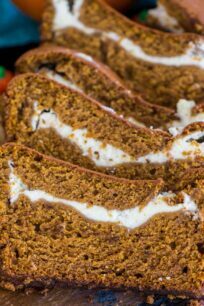 I definately do NOT turn my nose up to veggies in dessert and I love zucchini bread! 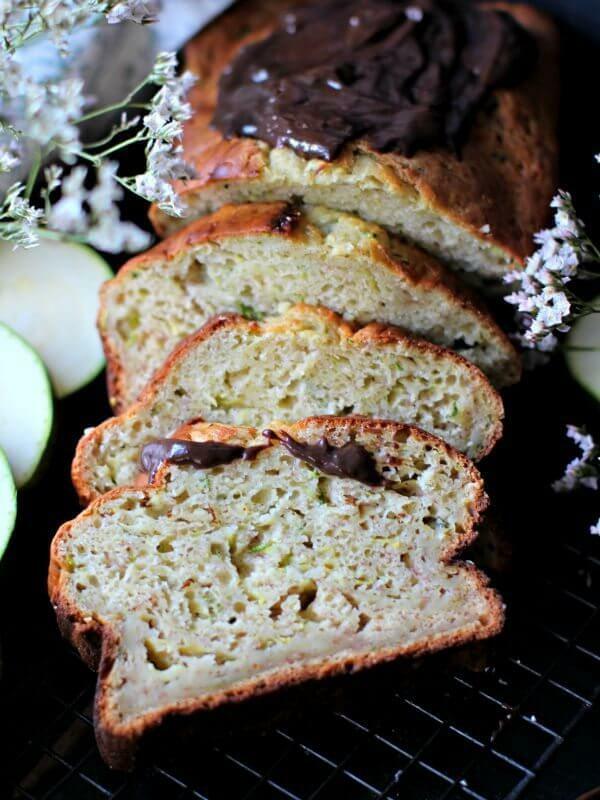 I NEVER would have thought of pairing zucchini and banana bread together- WITH vanilla and chocolate! I bet this combo tastes delicious!! I’ll have to nix the chocolate because of my allergy, but I can’t wait to try this bread!! Love the little green specs — soooooooo pretty!!! Cheers, girlie!! Cheyanne, the bread is actually perfect without the chocolate, that’s how I had my slice and believe me its still amazing! Hope your toe doesn’t hurt much and wishing you a great week ahead! Oh my word! This looks amazing!! Seriously… to think it has fruit AND veg?!! Girl you’re the best! 🙂 YUM! All of the flavors in this seem to go perfectly together! I am a sucker for zucchini bread, so I have a fork in my hand, ready to dig in to a big plate of your gorgeous bread 😉 Thanks for sharing! Oh yum, this truly looks like the perfect zucchini bread! And I adore that ganache on top! This bread looks amazing! Love the addition of the bananas AND zucchini! Great way to sneak in some fruits and veggies! Oh my, that looks so delicious. I’ll save in my bread pinterest borad so that I can make it soon! Oh my goodness, you just took this bread to the 10th degree!!! Banana AND zucchini bread with chocolate ganache no less? YES PLEASE!! !